They have released this weeks freebies: June 8, 2015. They’re available until midnight on the 14th June. Grab this weeks freebies from across Creative Market. Professional brush pack for Adobe Illustrator. This brush contains 16 high quality brushes intended for professional designers, illustrators and artists. Works with Adobe Illustrator CS3 and above. This weeks free pro brushes on creative market. Vector EPS format with 6 seamless patterns. Vector AI format with 6 seamless patterns. Present your designs on a clean and contemporary workspace with these eight mockups. These mockups were created with photographs of real objects (not 3D models) and they're extremely easy to use.This weeks free paper mockups on creative market. It Included 300dpi CMYK template in Adobe Illustrator (Ai), Indesign (Idml,Indd), Microsoft Word (Doc,Docx) file format. you get 3 style design and 4 color variations. All are arranged in layers labeled for easy customization and updates. template is fully customizable, Easily edit typography, words, colors and layout. This weeks free Resume / CV template on creative market. Emily Script Fonts is this weeks freebies, come on give it a try to Emily on your next creation, project or letter. A minimalist WordPress Blog Theme supporting responsive layout & Retina display. DW Kido comes with the handy Front-end post form & editor, which means you can instantly publish a post and edit it right on the front-end with no back-end needed. This weeks free WordPress Theme on creative market. 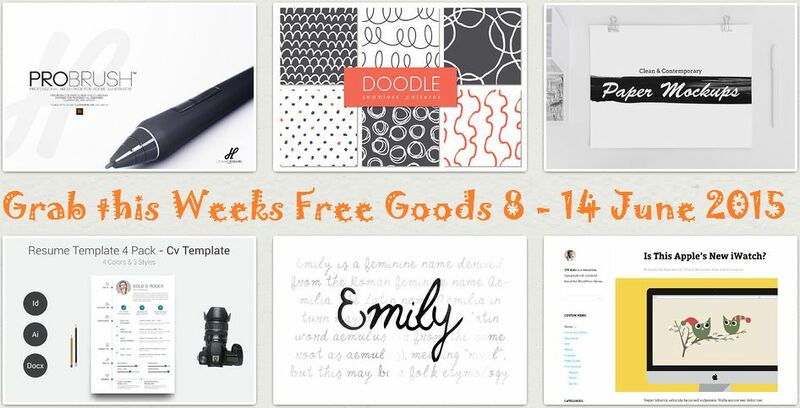 Item Reviewed: Amazing 6 Free Design Goods 2nd Weeks June 2015 9 out of 10 based on 10 ratings. 9 user reviews.